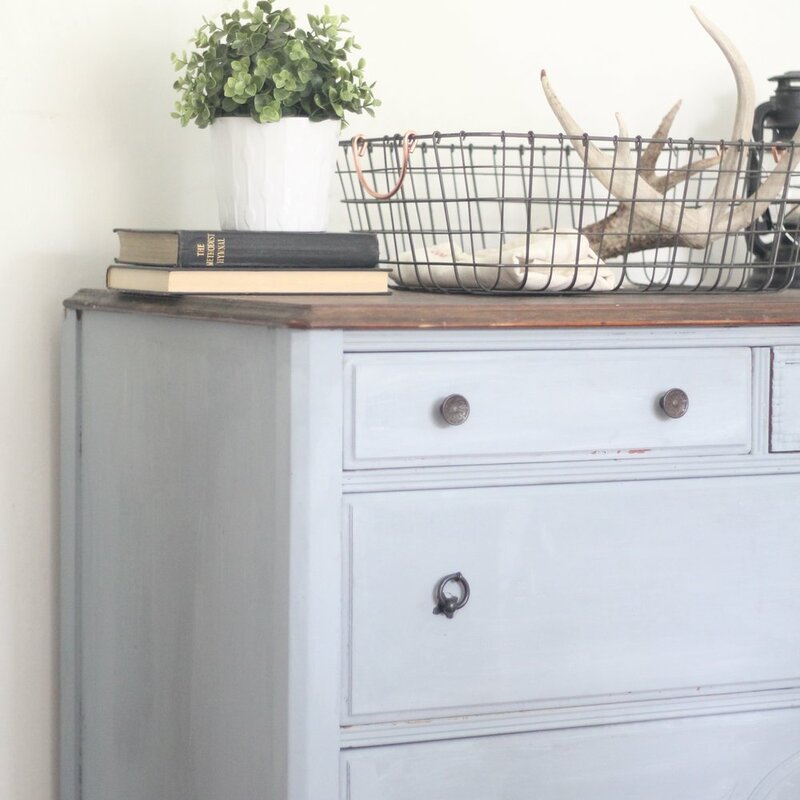 In my last bedroom update post, I promised I would share a little about our blue dresser that we refinished. I found this piece on buy, sell, trade for 50 bucks and just had to have it. 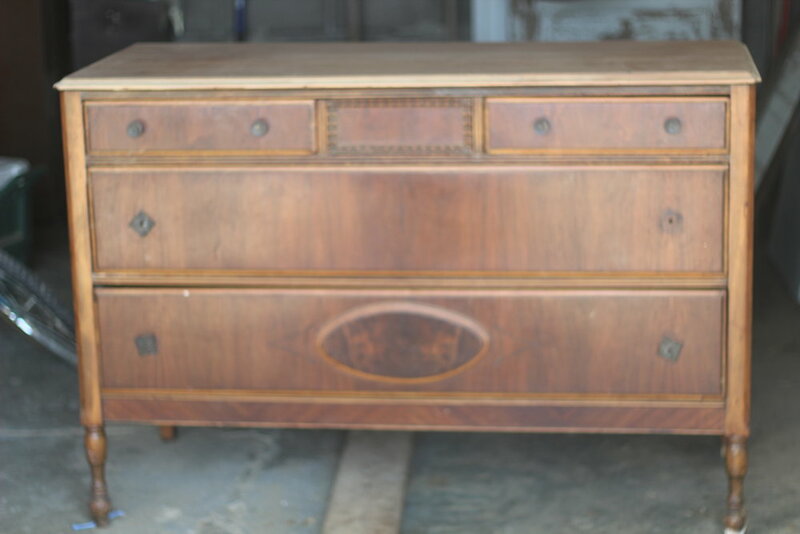 I though it would be a the perfect antique for my first attempt at milk paint. 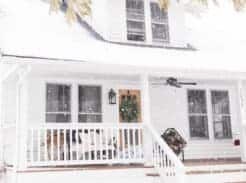 I was a little intimated by the milk paint process, since it comes in a powder form and needs to be mixed with water. 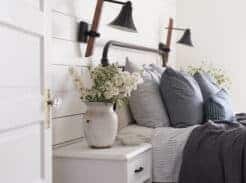 After looking through just about every single milk painted piece on Pinterest I decided to go with Miss Mustard’s paint line in the color Shutter Gray. I watched several Miss Mustard Seed YouTube tutorials and read all of the FAQ before attempting it. When it really comes down to it, it’s not complicated at all. You just add more powder if it’s too liquidy and more water if it’s too thick. 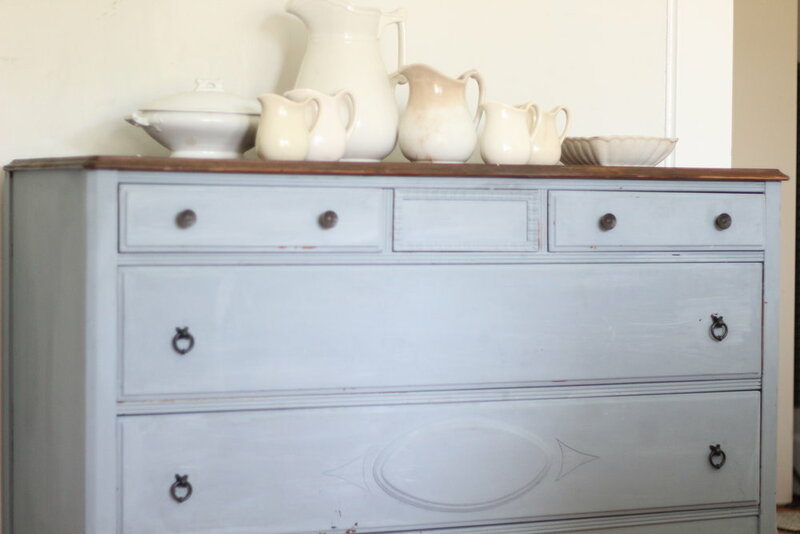 The advantage of milk paint is that it can go over any surface and can easily give that look of aged perfection. 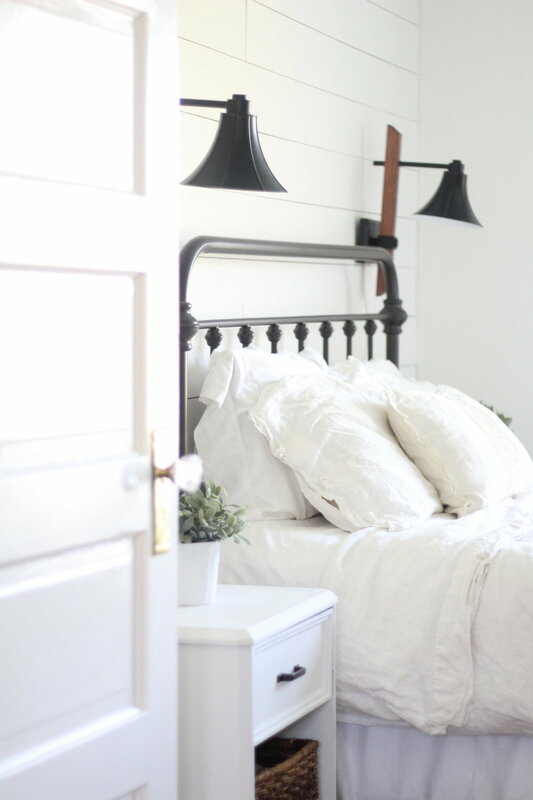 With milk paint, you never really know what you’re going to get. Some surfaces totally soak it up, and barely chip, and some hardly accept the paint at all. It’s kind of a trial and error process. This piece had a very old finish, so there wasn’t a slick coat of fresh polyurethane to repel the paint. It covered the piece very nicely and gave a few chips randomly throughout, making the distressed finish look more authentic. 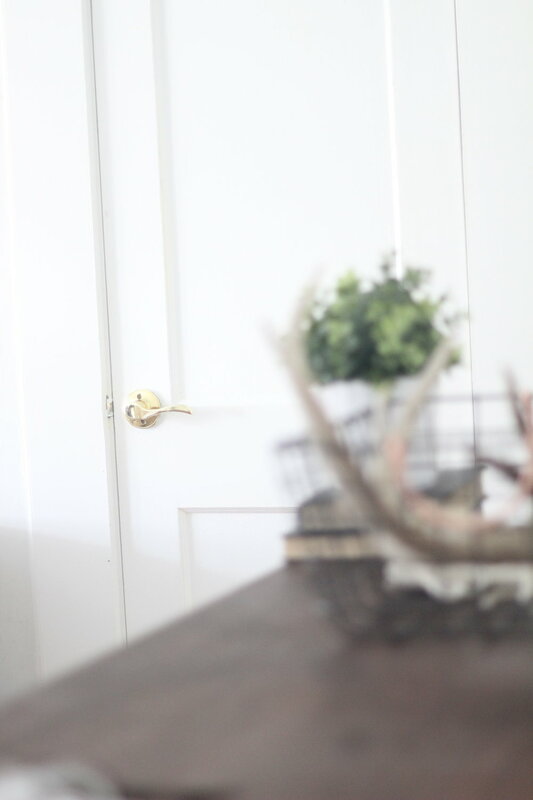 I love playing around with different items to style the dresser. Although I think the ironstone looks beautiful, I think those things are best left on tall shelves, out of the reach of children. My husband sanded and stained the top with a dark stain color. I like the contrast that the stained top adds to the light colored dresser. I found the hardware on Etsy, but I ended up seeing the same pulls later on Amazon for a cheaper price. 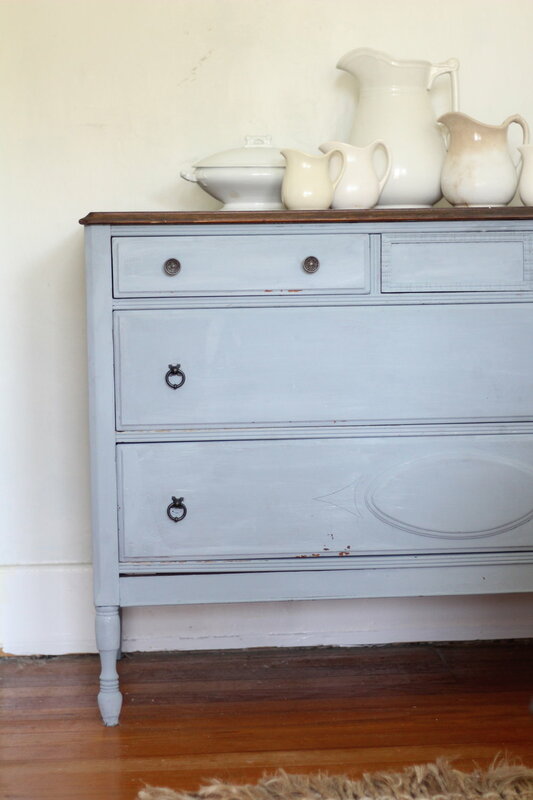 I have since tried milk paint on another piece, but the finish was far too polished and new. The paint would literally not cover it at all. I had to repaint it with chalk paint. I’ve read that can sometimes happen but isn’t likely. Plus, if you like your finish super chippy, new finishes may actually work great. I hope to update you soon with a set of night stands that I refinished for our bedroom. Thanks for reading along friends!